KAMPALA – Mr Mahamood Were’s three-quarter-acre rice garden in Lwoba looks green throughout with rice crop. The rice has grown above the traditional vegetables, also known as pig weed, both plants are healthy and are destined to yield good harvests for him this season. Beneath the rice are small streams of water flowing through the garden keeping the garden moistened throughout after he went against the traditional norm in the district of waiting for rains and started a local irrigation scheme for his rice. PML Daily finds Were, 59 in his garden in Lwoba in Butaleja district, weeding and preparing water channels that water his rice throughout the year. Mr Baker Nasoma, the chairman of Manafwa Basin Rice Growers Cooperative Society in Lwoba Irrigation Scheme, explains that basin irrigation is done by creating small channels along the field length in the direction of a slope. Mr Were is not alone in this area, many small scale farmers in Lwoba in Butaleja district have adapted to small scale irrigation methods in order keep their harvest high and fight Climate Change effects on their crops. Mr Christopher Kibanzanga, the state Minister for Agriculture says for many years, Ugandan farmers have relied, and thrived, on rainfall to water the land, with irrigation mostly associated with large-scale schemes for crops like rice or sugar canes or flowers for export. He said because the climate is changing, droughts are becoming more frequent, Uganda has suffered at least eight serious droughts in the last 40 years, compared with only three in 60 years leading up to 1970. According to the 2009 Least Developed Countries (LDCs) report, produced by the U.N.’s Conference on Trade and Development, lack of water has increasingly led to a drop in food production in countries like Uganda. Eng Richard Cong , commissioner, water for agriculture says the viability of rainfall is becoming increasingly compromised by climate change, especially unreliable rainfall, and that the only way to lessen the effects of unreliable rainfall is by applying water to the soil and crops (irrigation) when need arises. Eng Cong says the potential to sustain crop production by promoting irrigation has for long been recognized by communities, government, non-government, and public sector players. He added that the ministry of Agriculture, Animal Industry and Fisheries [MAAIF] is implementing the directive of the President to fully utilise the existing [water] resources to promote irrigation systems across the country. Eng Cong explains that MAAIF carried out a countrywide rapid assessment of irrigation potential and requirements and that the master plan is expected to show which areas can be used for irrigation in each of Uganda’s 112 districts. He explained that irrigable areas have been divided into two categories: category A for those near to permanent water bodies like lakes and rivers and category B for areas to which water will need to be moved into artificial valley tanks or dams. According to MAAIF, Uganda is gifted with lakes, rivers and swamps, where water for irrigation can be tapped but that it is still ranked among the countries with the least irrigation coverage in Africa. Africa irrigates about 13.4 hectares (34 million acres or one percent of the arable land), but most of it is in Egypt, which uses River Nile water. 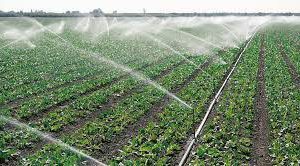 Eng Cong says the total area under formal irrigation in Uganda is 14,418 hectares (35,612 acres) out of an estimated 560,000 hectares with irrigation potential and that the plan is to increase the utilisation of category A land from 5% to 25% by 2020 and to 70% by 2035. According to the proposal by ministry of agriculture, the farmers will meet 60% of the costs, while government meets the remaining 40% and that the farmers’ costs would depend on the type of technology suitable for use on individual farms, but could include digging on-farm tunnels or buying pumps. “The most suitable pump for most areas in Uganda – would be the Ecologics step action pump, which costs about $500. This pump can get water from 8m deep and up to 20m high within a radius of up to 1km,” Eng Cong says. Mr Kibanzanga said the government is rehabilitating Mubuku, Doho, Agoro and Olweny irrigation schemes, the traditional government schemes and that the project is aimed at restoring the irrigation potential of the four schemes to improve farm incomes, food security and rural livelihoods. “This is being done through sustainable natural resources management and agricultural enterprise,” said Mr Kibazanga. He added that the other scheme are Kibimba scheme, River Mpologoma irrigation scheme, Lwoba irrigation scheme, Lugazi irrigation scheme and Kakira irrigation scheme, Kinyara irrigation scheme sand many others that are producing rice and other crops throughout the year across the country. Mr Baker Nasoma, the chairman of Manafwa Basin Rice Growers Cooperative Society in Lwoba Irrigation Scheme, says one of the reasons Ugandans have not adopted full-scale irrigation is that the rains have been relatively good throughout the years. “In Uganda, we normally have two rainy seasons, one running from March to May and another running from October to December,” Mr Nasoma explains. He however adds that climate change has affected the seasons to the level that irrigations has become the only way to save crops across the country. “When it starts raining heavily across the country, farmers need do more to harvest the rain water and use it later when the rains stop. We should also make good use of the water bodies in our midst,” Mr Nasoma said. Mr Nasoma admitted that starting irrigation systems across the country is a very expensive venture. However, he said, it is tenable. Mr Abdul Mugambe, an irrigation farmer and trainer explains that however there are cheaper alternatives; take the example of the Wonder Water Pump and that the pump, which goes for Sh250,000 (US $150), is relatively affordable to medium-size farmers across the country. It is a foot operated, two cylinder, and high performance equipment. “A farmer can move it from one corner of the farm to the other without any problems because it is light,” said Mr Mugambe. He revealed that although adoption of the Money Maker system is still low in Uganda, in Kenya, more than 6,000 small-scale farmers have adopted the Money Maker irrigation system in the last few years. He says that the pump can be operated from any source of water and the water can be harvested and stored in underground tanks. “And a horse pipe attached to the pump is dropped in the water source while another longer pipe, also attached to the pump with a stand at the end, is placed in a section of the farm that a farmer wants to irrigate. Then, the farmer starts moving his feet on the pedals. “The pressure can push water through 200 meters if the ground is level,” Mr Mugambe said. He adds that the pump is capable of irrigating at least two acres of land per day and that the fact that the pump is mobile means that two farmers or even more from the same area can pool funds, buy one pump and share it out. However, according to Mr Mugambe, adoption of this pump by farmers has been low and thinks that the government should come in and help farmers acquire this water pump, just like they are doing with the acquisition of walking tractors for farmers. Bucket-kit drip irrigation is a low cost method that delivers adequate amounts of water to crops in an efficient way both in terms of labour and quantity of water used. The system is locally assembled using an ordinary plastic bucket and drip lines readily available in shops selling farm equipment. The buckets serve as the reservoir and are raised to a height of 1m to allow water to flow to the plants by gravity. A type of localized irrigation in which drops of water are delivered at or near the root of plants. In this type of irrigation, evaporation and runoff are minimized. According to President Museveni who has used drip irrigation, it is the cheapest and effective irrigation method for any farmer in the country can afford. -There is also a Makerere University manufactured a solar powered system which can deliver 20,000 litres of water per day and can irrigate an area of 10 to 15 acres depending on the water source. Mr Mugambe says they have also manufactured a coupled pump, which can pump 50 litres per minute (3,000 per hour) and that the pump costs about Shs250,000 ($100) and Shs480,000 with a drive and looks more affordable to small-scale farmers compared to an imported Chinese version which costs more than $360 (about Shs900,000). Mr Okasai Opolot, the director Crop Resources says another method is the use of a tredo pump being used by farmers in Masaka. A tredo pump is an instrument that manually draws water from a water source to the surface. He adds that it has two cups with nasals and these cups are filled up with water before it operates. The use of this water is to reduce friction during the operation of the machine. Water is distributed over and across land by gravity, no mechanical pump involved. Water is distributed under low pressure, through a piped network and applied to each plant. Water is distributed by overhead high-pressure sprinklers or guns from a central location in the field or from sprinklers on moving platforms. Water is distributed by a system of sprinklers that move on wheeled towers in a circular pattern. This system is common in flat areas of the United States. Water is distributed through a series of pipes, each with a wheel and a set of sprinklers, which are rotated either by hand or with a purpose-built mechanism. The sprinklers move a certain distance across the field and then need to have the water hose reconnected for the next distance. This system tends to be less expensive but requires more labour than others. Water is distributed across land by raising the water table, through a system of pumping stations, canals, gates, and ditches. This type of irrigation is most effective in areas with high water tables.